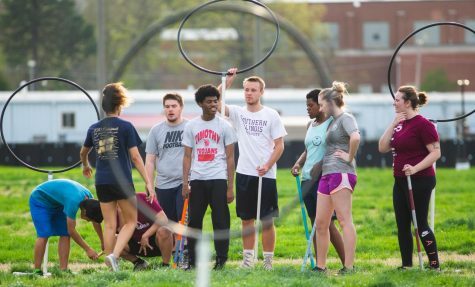 This semester closed out an excellent year for Saluki Athletics. Here’s what the Daily Egyptian sports desk decided were the 10 best performances in SIU athletics in spring 2016. After three years of mediocrity, men’s basketball coach Barry Hinson is finally top man in the conference winning the 2016 Missouri Valley Conference Coach of the Year award. Hinson is probably the most recognizable face in Carbondale. With his combination of humorous charisma off the court and his serious demeanor on the court, it’s hard not to like the guy as a person. However, his 40-57 record through his first three years at SIU made it tough for fans to desire keeping him around. Couple that with having five players transfer out of the program after Year Three, and many took to the blogosphere calling for his job. But, the new — at the time — Director of Athletics Tommy Bell stuck with Hinson and was rewarded. Piecing his team together with junior college players (Mike Rodriguez, Leo Vincent) and the few returners who played significant minutes (Anthony Beane, Sean O’Brien, Bola Olaniyan, Tyler Smithpeters), Hinson led SIU to its first 20-win season since 2006-07. There was still criticism for Hinson’s soft nonconference scheduling — which ranked fifth-easiest in Division I according to kenpom.com — but is that a bad thing? 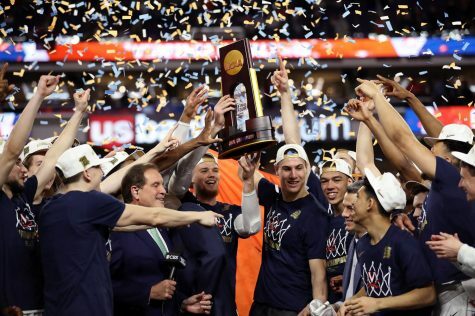 He got the team to relearn something the program had forgotten: how to win. 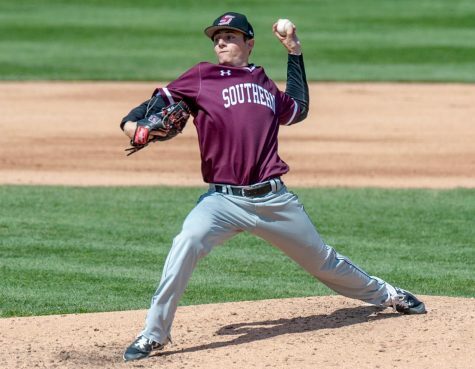 Anthony Beane had a great career for SIU, and the Salukis best season in a nearly a decade was a great send off for the Normal native. He led the team in scoring, 3-pointers, free throws made and field goals. Beane was second in scoring in the conference, named a First Team All-MVC selection and part of the Lou Henson All-America team. Aside from all the awards he earned, the most important feat may be tying the all-time scoring mark at SIU Arena. On Senior Night against Missouri State, Beane’s 19 points tied the mark (885) set by Mike “Stinger” Glenn, who played nine seasons in the NBA. Unfortunately, Beane did not play in the final 12 minutes of the game after hitting his head on the court. It would be hard to believe that Beane would not have scored during those 12 minutes, but even though he shares the spot, Beane is still No. 1. 8. Michael Baird throws a one-hitter against Illinois. The highlight to this point of Michael Baird’s stellar sophomore season came March 20 when he took a no-hitter into the ninth inning against Illinois. A leadoff pinch-hit single by freshman pinch hitter Jack Yalowitz in the final frame was the only hit the Illini would muster against the 6-foot-5 right-hander. Baird finished the game with four strikeouts and three walks, needing 106 pitches to put away Illinois. Although he missed out on the first Saluki no-hitter since 1979, his complete game shutout was the program’s first since 2012. Baird earned Missouri Valley Conference Pitcher of the Week honors for his gem. Baird has continued his dominance of opposing lineups, sporting a 8-3 record with an MVC-leading 1.74 ERA. His eight wins also lead the Valley. Two Saluki seniors made their marks on the women’s basketball record books, as guard Cartaesha Macklin and center Dyana Pierre became the career leaders in program history in points and rebounds, respectively. Macklin became the Dawgs’ all-time leading scorer with the first basket of a 74-56 win Jan. 16 against Evansville, breaking Amy Rakers’ 25-year-old record of 1,538 points. Macklin finished her career with 1,779 points. She is also the all-time leader in free throws made with 465. Pierre took first place in career rebounds Dec. 22 in an 87-72 win at SEMO, picking up seven boards. She finished her career with 1,218 rebounds, passing Sue Faber’s 1,014. Pierre is also the career leader in blocked shots with 162. Senior Jonny Rigby clinched the match against No. 46 Drake to tie for first place in the MVC regular season. For Rigby, this was his last regular-season conference match and the first time the team had beaten Drake since 2009. Rigby, playing No. 1, defeated Ben Lott (DU) in a tight three-set match. He took the first set 7-6(4) but then fell in the second 7-5. The match would be decided in the third and Rigby came out strong, taking the set 6-1 to clinch the win 4-3. “It was a really proud moment because it was a big team effort, so I was glad to get us over the line,” Rigby said. In his time at SIU, his most impressive achievements include being named to both the MVC Scholar-Athlete First Team and MVC Honor Roll. He also went undefeated in doubles in the 2013-14 season, which was the only doubles team in the conference to do so. With 145 combined singles and doubles wins in his SIU career, Rigby leaves his mark with as the second-winningest player in the program’s history. Twenty-nine no-hitters have been thrown in Saluki softball history, but none have happened earlier in a career than freshman Nicole Doyle’s. March 12, Doyle no-hit the Hartford Eagles in her first collegiate start as part of the USF UnderArmour Invitational. The start was a rebound from Doyle’s debut a week earlier, when she threw 3 1/3 innings allowing five runs on five hits, six walks and three strikeouts in relief. She shut down the Eagles all day March 12, getting nine of her 21 outs from flyouts, five from groundouts and seven from strikeouts. 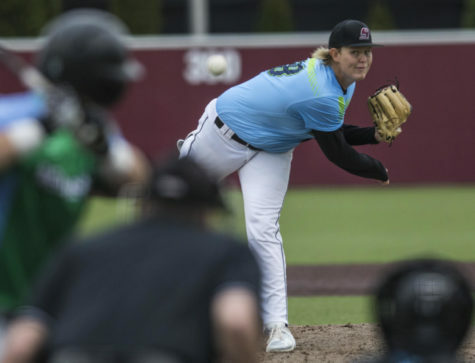 A sixth-inning walk was the only thing that stopped the Aurora, Ohio, native from achieving a perfect game. 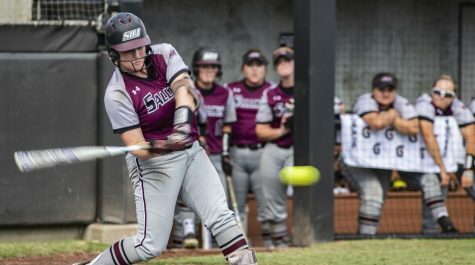 Eight months removed from a torn ACL, Doyle’s no-no was the first by a Saluki freshman since Carissa Winters in 1997 and the first overall since Danielle Glosson’s 2011 no-hitter. For the first time in the program’s history, the SIU men’s tennis team won a share of the MVC regular-season title. Wichita State eventually won the conference tournament for the 25th time. 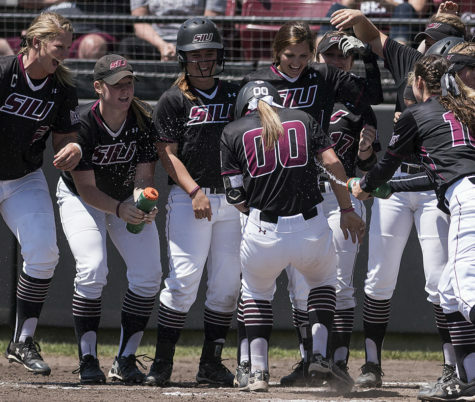 The Salukis finished with a record of 13-4 and 2-1 against MVC opponents. “We all realized we were working hard for the same goal and that goal was attainable. We improved during season and played our best tennis during April,” coach Dann Nelson said. When the track and field season finally ends, senior thrower DeAnna Price will go down as one of the best female athletes SIU has ever seen. Price, the NCAA outdoor champion in the hammer throw in 2015, wasn’t quite finished setting records and gathering awards in her final season. Price sat out the indoor season and wasted no time moving up the throwing charts once competition moved outdoors. Sitting in second in all of college for the hammer throw heading into the duel meet against SIUE, Price had a 72.66 meter throw that moved her into first place passing former Saluki Brittney Riley for the record. For her efforts, she was named the Missouri Valley Conference female field athlete of the week for the sixth time this season and named to the Bowerman watch list. 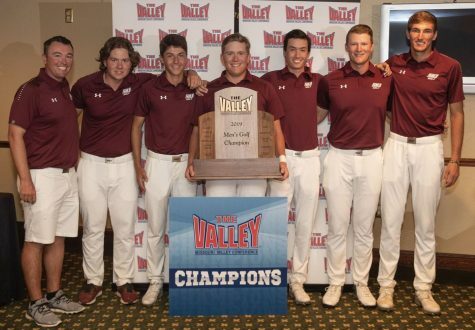 SIU men’s golf finished fifth in the regular season in the MVC and was predicted to place fourth in the pre-tournament poll, but came out on top April 26. Wichita State, in the midst of an eight-year reign over the MVC, was unanimously favored to win. 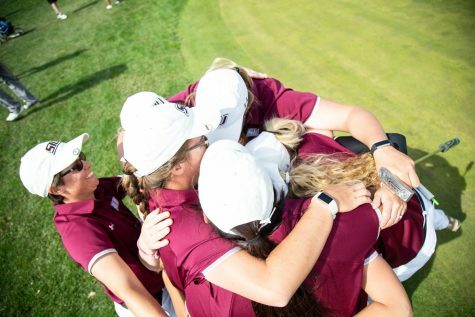 The Salukis, whose best finish ever was second place in 2015, dethroned the Shockers and brought home the program’s first ever men’s golf title, after 41 years. The Dawgs had four golfers finish in the top 11 at Prairie Dunes Country Club in Hutchinson, Kan., led by top-five finishes from junior Brandon Carlson and freshman Peyton Wilhoit. 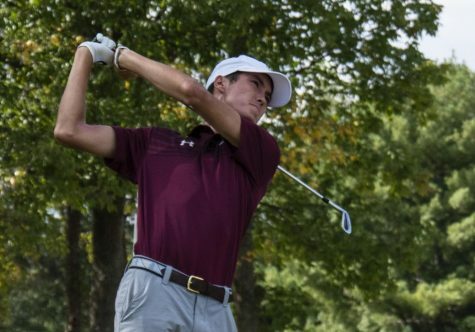 Carlson finished third (+5) and tied with Kyle Hosick in 2004 and Chad Cooper in 2006 for the best individual finish in SIU MVC tournament history. Since the team is only losing two seniors, it is poised for another successful season in 2016-17. It didn’t matter that Missouri State women’s swimming and diving won every conference title since 2008, but that changed Feb. 20. at Edward J. Shea Natatorium in the Recreation Center. 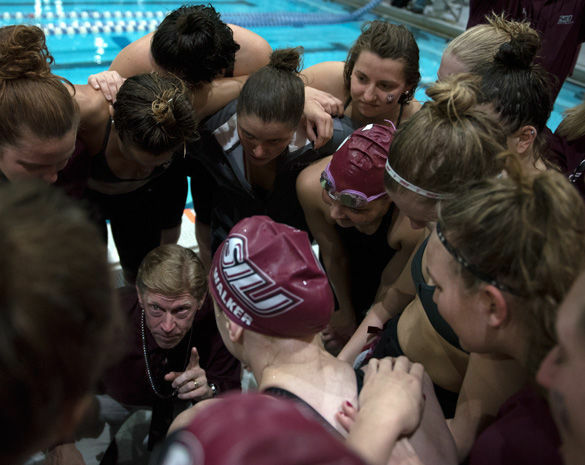 The Saluki women won every dual meet on the year and craved their first title since 2007. But despite competing at home and defeating the Bears earlier in the season, SIU still wasn’t the favorite to win. It didn’t matter. The team led Missouri State after the first day of competition. Then things got crazy. The Bears took a 31.5-point lead heading toward the end of the night before senior Sherry Zhang and sophomore Rachel Williams took the top-two spots in the 3-meter dive to start the comeback ahead of the final event. 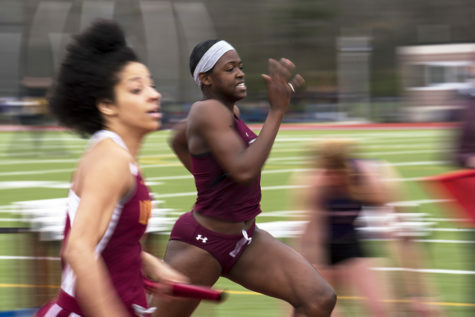 The Bears held a 1.5-point lead heading into the final relay, and SIU needed to beat Missouri State in the race for the conference crown. Saluki sophomore Bryn Handley finished second and beat the third-place Missouri State senior Rebecca Amparano by .65 seconds on the final leg. The instant her hand touched the wall, pandemonium ensued. With a final score off 799.5, the Salukis won the team title by half a point. The script couldn’t have been written any better. Coach Rick Walker shed tears along with the team. Although he was wearing a dress shirt and khakis, Walker kept an earlier-made promise and did a victory flip into the pool off the high dive. A remarkable night filled with emotion and a moment that will go down as one of the biggest in Saluki sports history. The Daily Egyptian sports desk can be reached at 618-536-3307.